Rates: $225/night, $195/night (2 nights), $180/night (3 nights). Longer? Call us! 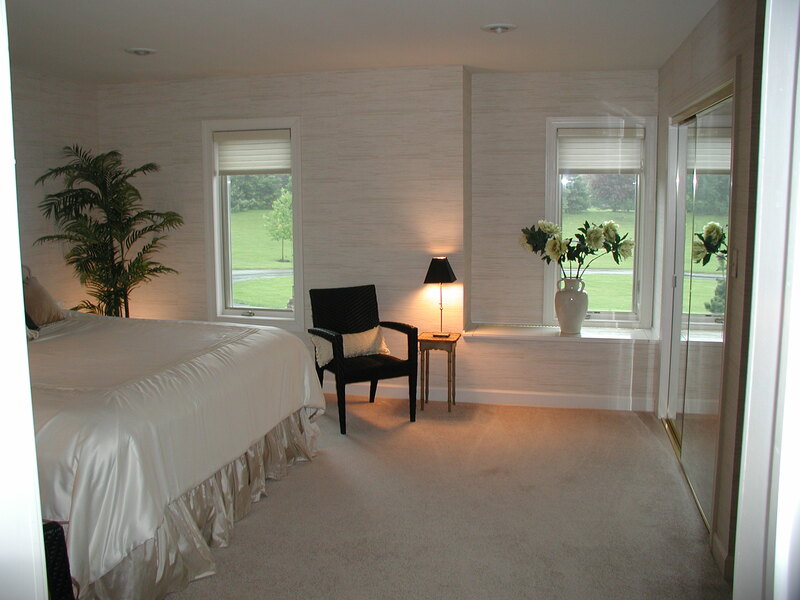 This theme room is a suite, housed in its own separate and private building with 3 separate rooms. 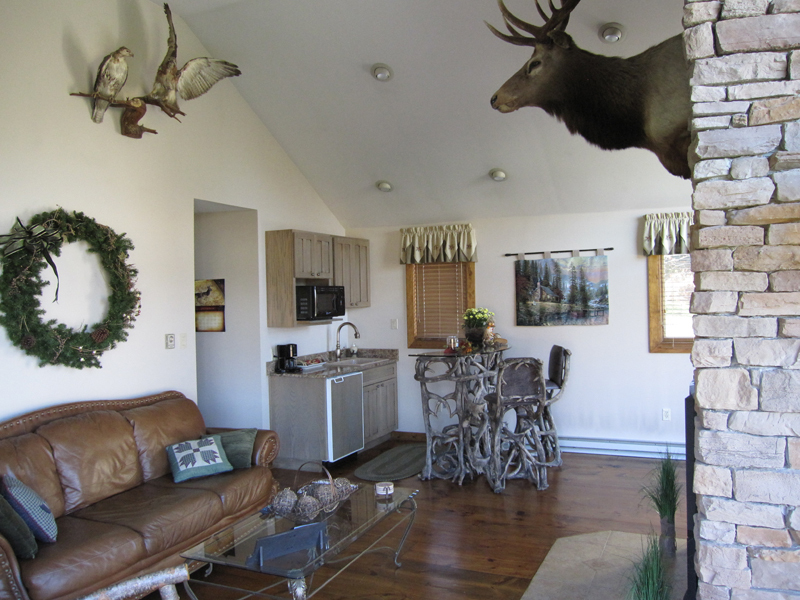 The inside is rustic appealing to both nature lovers and sportsmen alike. 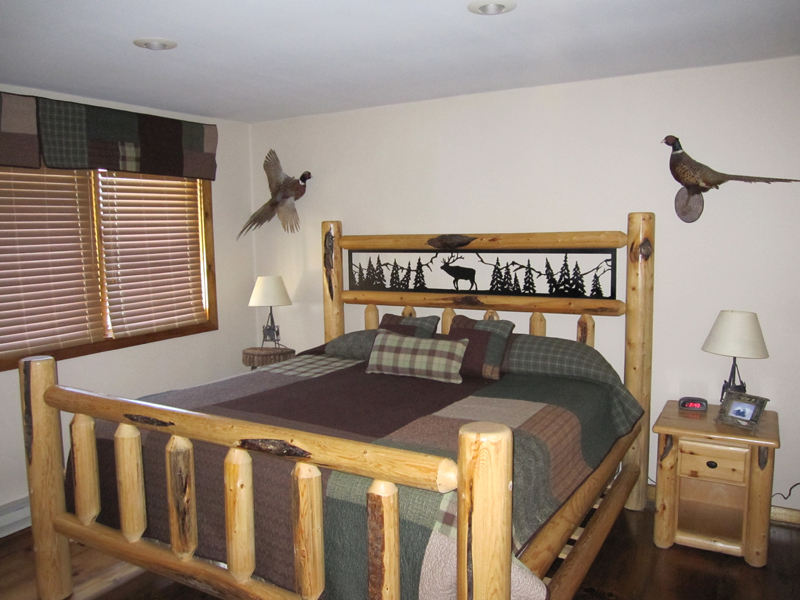 The bedroom has a king-size, log bed, matching armoires, large closet, and a large flat screen TV. 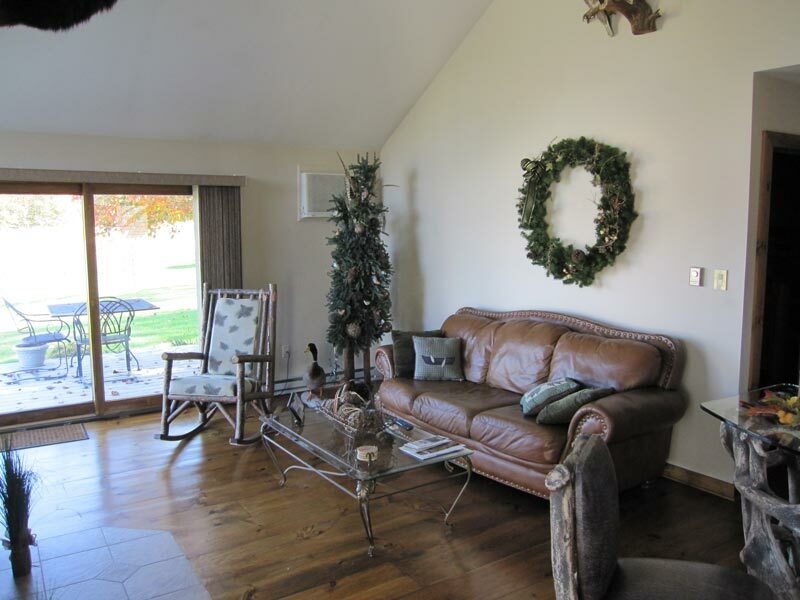 The great room has cathedral ceilings, TV/DVD, small kitchen with microwave/toaster, bar and chairs, large leather sofa, rocking chair, and a beautiful view which overlooks both lakes and woods through abundant glass windows and doors. A private, large wrap around deck with table, chairs, and glider provide an ideal setting for outside dining and relaxing. 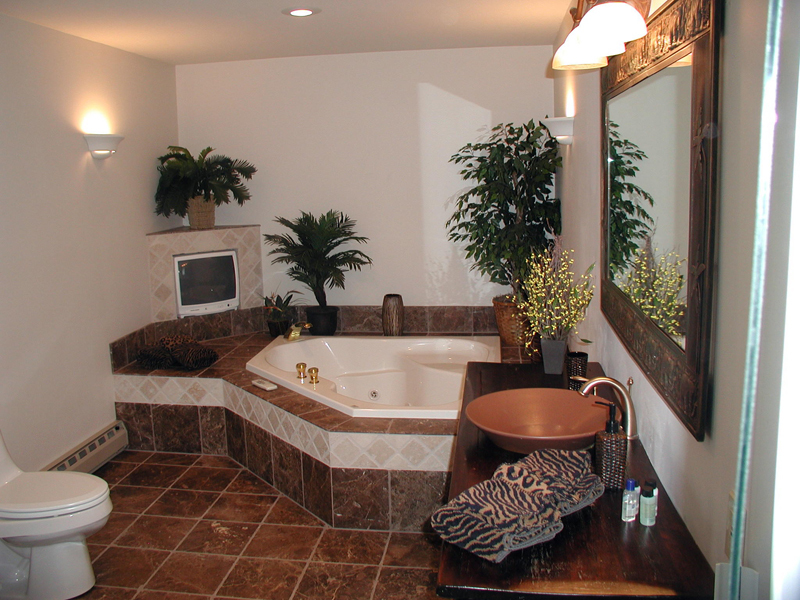 The bathroom has a corner Jacuzzi, large enough for two people, a flat screen TV, shower, and unique vanity and mirror. 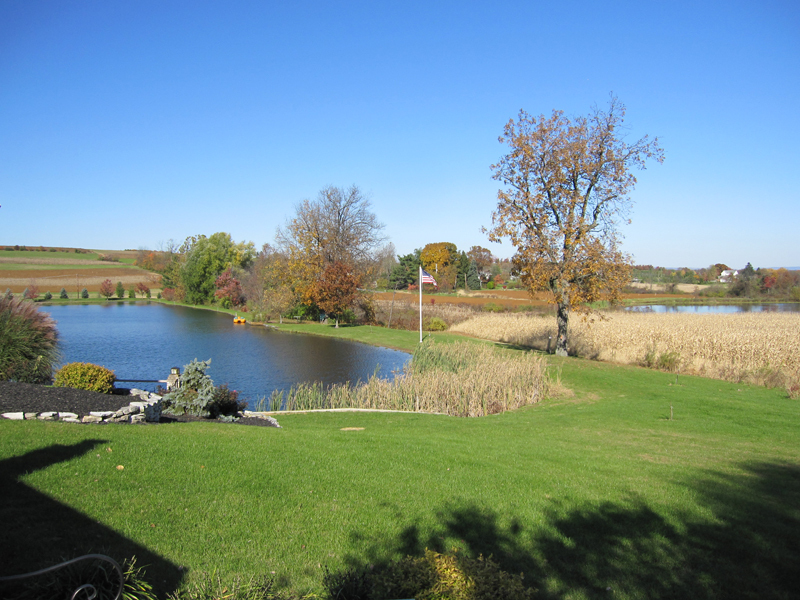 Rates: $160/night, $145/night (2 nights), $130/night (3 nights). Longer? Call us! This room has a private outside keyed entry from a paver walkway, king size bed, TV/DVD, ample closet space, and large tiled bathroom with seated shower. Great for honeymoons, anniversaries, or special occasions. 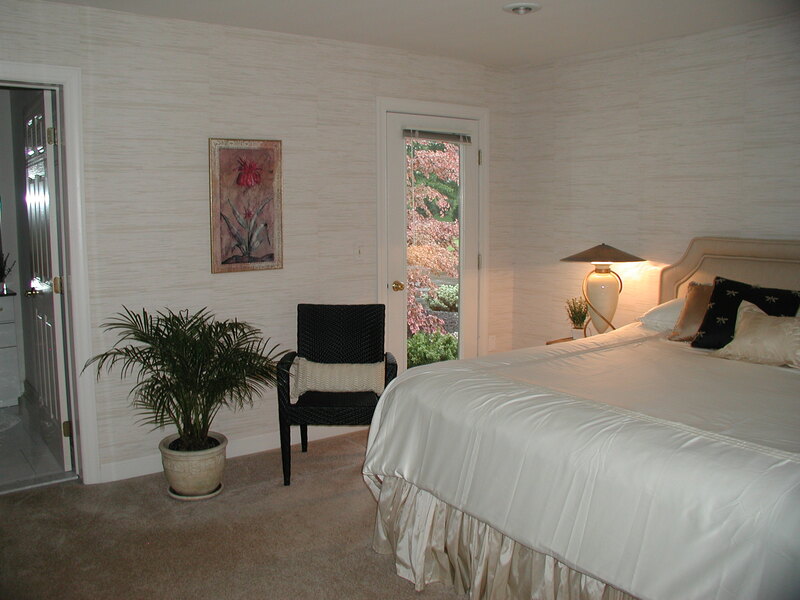 This is our newest room which we opened this year for seniors 55 years and older. 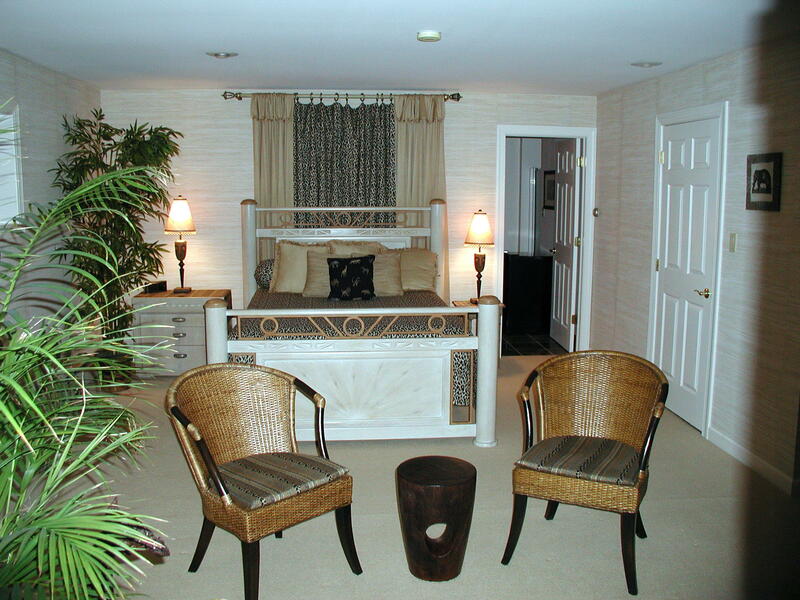 This theme room has a separate, keyed entrance area all on the flat with easy access from the parking area. 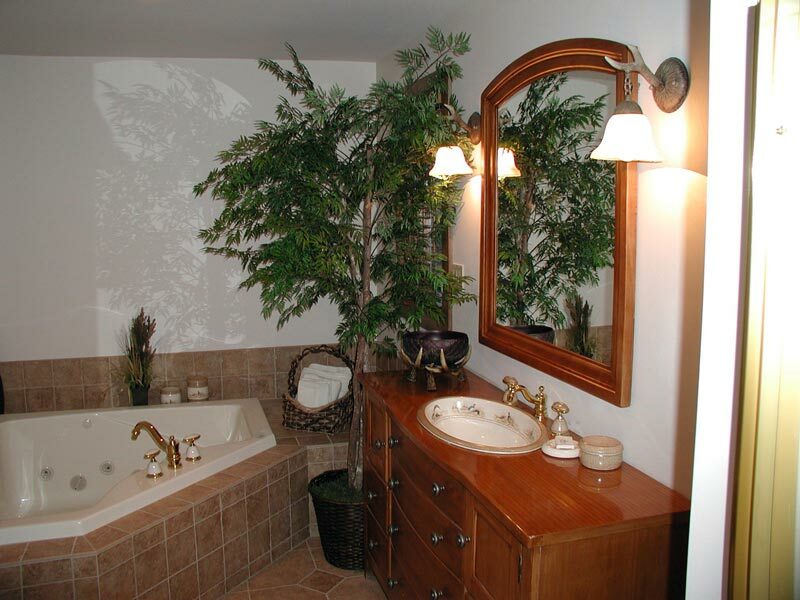 There are three separate areas for your enjoyment and relaxation mostly furnished with top quality Tommy Bahama items. The sleeping and TV viewing area has a king size bed, a large flat screen enclosed in an armoire which can be viewed from either the bed or 2 soft chairs. Accessories include 2 night stands, table lamps, and snack table. The enclosed bathroom has a large corner Jacuzzi which can accommodate 2 persons, an open gentle rain shower, vanity, toilet, heated tile floor, cable flat screen TV, and surrounding stone walls. 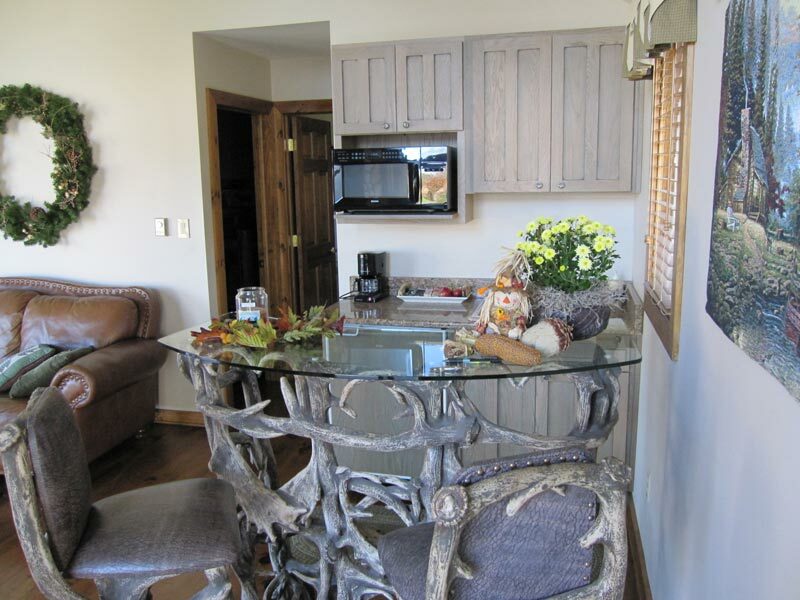 The third area has large closet, dining table with 2 chairs, breakfast bar with microwave and coffee maker. Outside covered porch with 2 chairs and small side table overlooks 2 private lakes. Wireless internet is available from a nearby router. 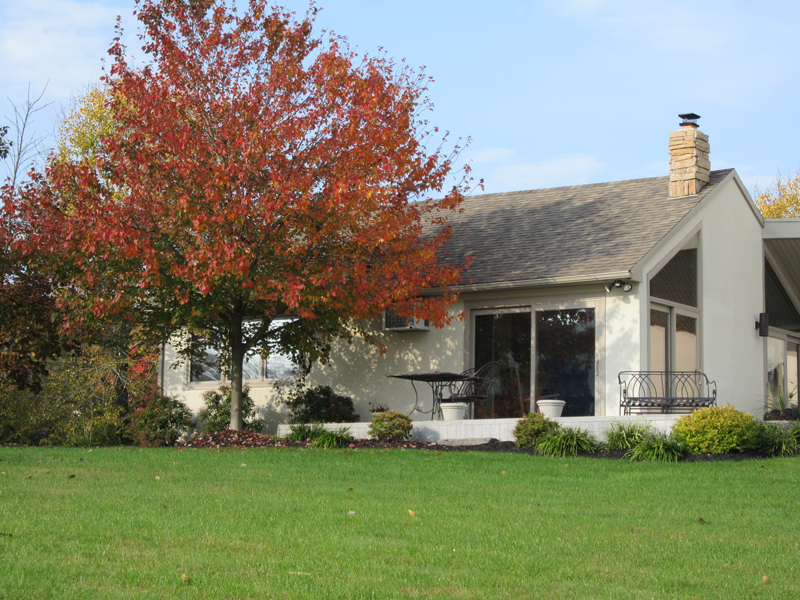 Rates: $195/night, $180/night (2 nights), $175/night (3 nights). Longer? Call us! 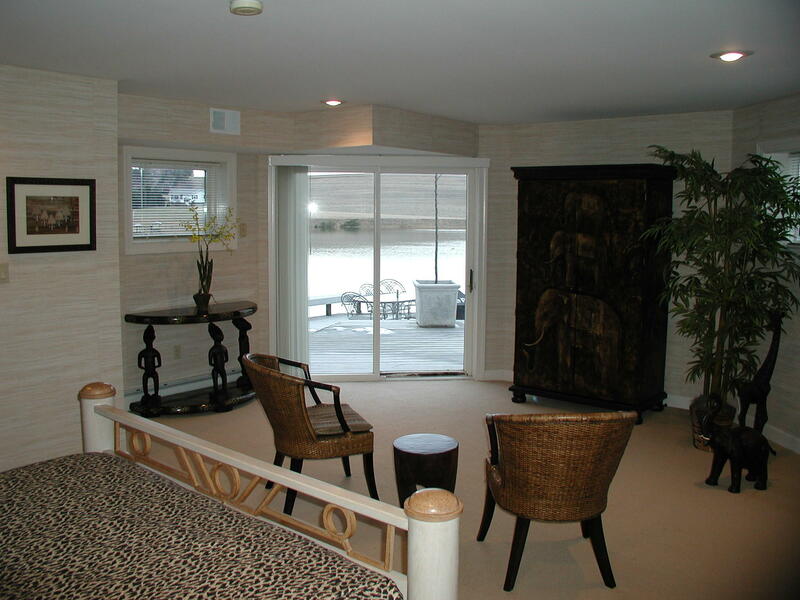 These theme rooms have a queen size bed, separate seating area which overlooks our 3 acre lake, private outside keyed entry with direct access to 3 level deck/pier and paddle boat, TV/VCR/DVD viewable from the bed or seating area, ample closet space, and finally, a large tiled bathroom with a Jacuzzi, recessed TV, and shower.